We like to keep things simple here at Ellie and Argyle. Our vision is to make great bandanas that represent and share your own individual style with your dog and/or baby. Let your style shine on. Our baby bib bandanas are handmade in Denver, Colorado! They feature a SUPER SOFT backing and are pre-shrunk, double stitched and adjustable. Two snaps allow the perfect fit for babies 3-18 months. Machine wash with like colors and dry on low. Due to the handmade nature of our baby bib bandanas, please allow for slight variations in color, print placement and size. Dog Bandanas | Which Size? 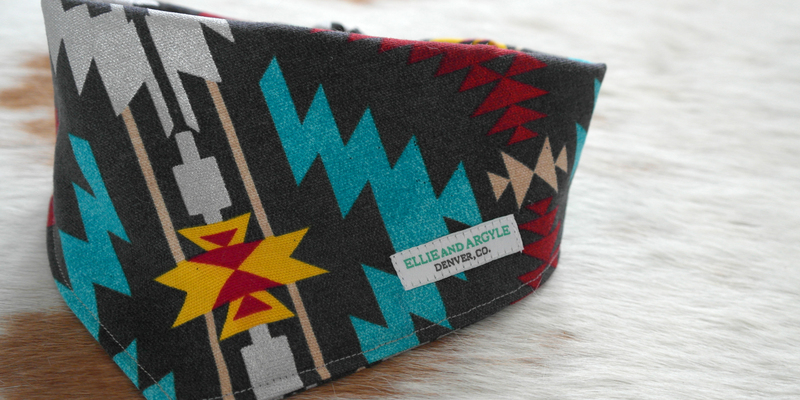 From the very small to the very large, Ellie and Argyle has the perfect fit for your dog. Our dog bandanas are high quality, handcrafted original designs meant to showcase your dog's personality and your style. Measure your dog’s neck circumference in inches, making sure not to pull the measuring tape too tight allowing for a few inches of wiggle room for you to tighten or loosen. Alternatively, you can measure a collar that fits your dog’s neck currently. All our dog bandanas are adjustable depending how tight you tie it. Be sure to firmly tie the bandana to ensure it will not fall off your dog. These bandanas are preshrunk, washable, double-sided and reinforced with double stitching for extra durability. Bring a fresh and inspiring look that compliments a your dog's style....from outdoors to urban and in between! Use the chart below to determine the correct size. Keep in mind that our dog bandanas tie so they can be flexible in length. If the bandana seems a bit too big, folding it down at the top can help adjust the fit. If the measurements are in the middle of two sizes, or you’re just not to sure which size to choose, choose the larger size.